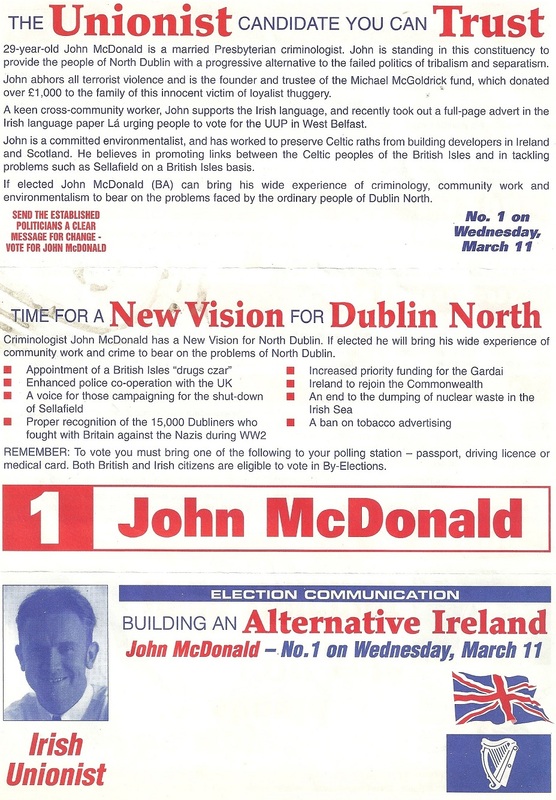 From the 1998 Dublin North By-Election a leaflet from Irish Unionist candidate John McDonald. He polled 107 votes . 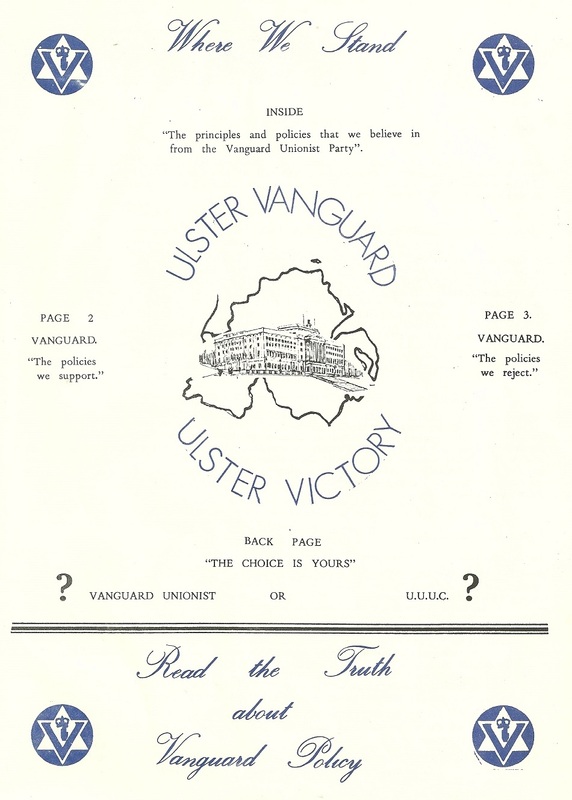 “Where We Stand” a leaflet from the Vanguard Unionist Party (Ulster Vanguard) outlining what they were for and Against as well as the difference between themselves and the Ulster Unionists. 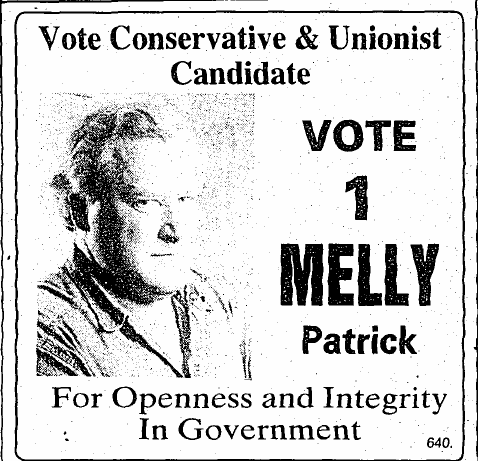 From the 1992 General Election a flyer from Patrick Melly… a rarity in the Republic of Ireland in that he was a Unionist candidate. There is of course a ‘Protestant Vote’ in certain areas of the country, more often than not though its in Local Elections that it manifests itself with the likes of the Donegal Progressive Party and Protestant Association candidates fielded (and elected) in Donegal and Monaghan up until recently. 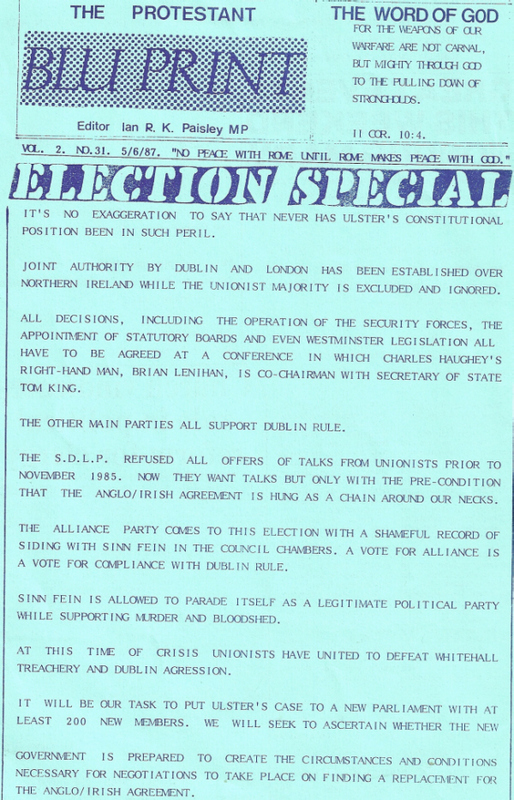 In 1987 there were 2 ‘Unionist’ candidates in Michael Brooks (running as an Ulster Protestant polled 696 votes in Donegal South West) , Stan Davies (Unionist polling 134 votes in Cork South West) and another candidate Ronald Smith ran in Louth on a ticket demanding Bible readings in the Dail (he got 86 votes). For the record Melly polled 73 votes in what I think was his only electoral outing. 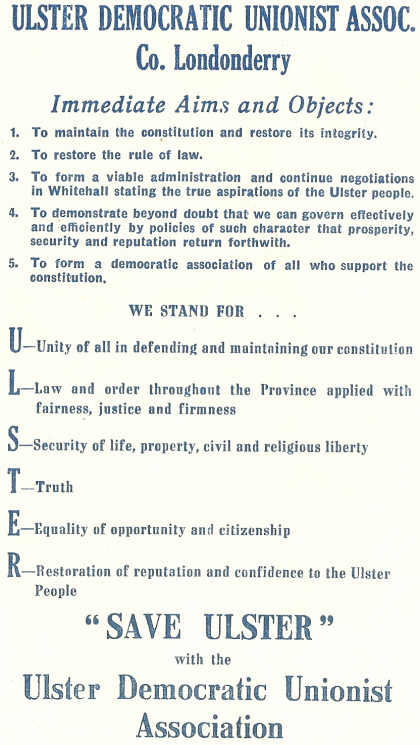 Got this recently , a leaflet from the ‘Ulster Democratic Unionist Association Co. Londonderry’, outlining their aims and objectives. I think its from the early 80s but can’t be sure. I can’t find anything online about them. I presume that they were linked to the Democratic Unionist Party. If anyone has any details of the group I’d love to know.